ICM Group has the expertise, equipment and commitment to get your materials handling equipment back online safely and quickly. 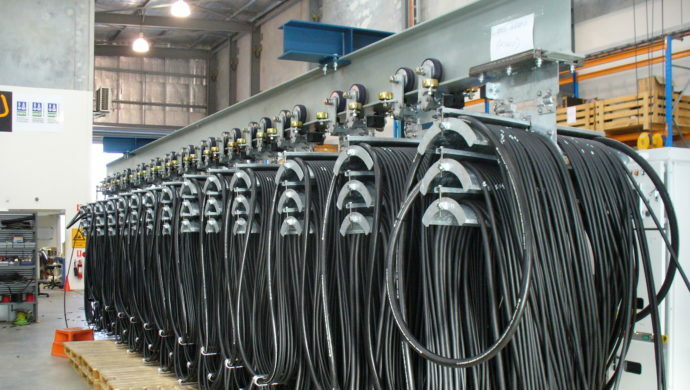 Our specialised services can minimise shutdown time for trailing cable replacement. ICM Group consist of: Electricians, HV cable jointers and licensed communications technicians. We can also offer the services of a VSD Technician to fine tune systems during commissioning. Its 8t safe working load easily handles 800m of 6.6kV cable without stressing the cores and minimises manual handling. ICM Group’s purpose built cable reeler reduces manual handling risks, physical risks to the new cable during transfer, labour required and speeds up the process so the client receives a safer change out in less time. Discovering damaged cable usually means significant costs to replace hundreds of metres of cable, loss of production and downtime needed for a shutdown. ICM Group now offers you a convenient alternative. *Subject to equipment and specialised staff availability. Regulation 5.27, associated with Trailing Cables. “… requires mines to have an appropriate maintenance system in place to ensure that electrical equipment and installations are maintained in safe working order.” Mines Safety & Inspection Regulations 1995 (WA). All repairs are carried out in accordance with AS/NZS 1747:2003.